Keven Ring assembles a 1791 Manhattan. Give me a crisp, clear-liquor drink with a splash of something sparkling, sweet or sour, or a glittering glass of chilled rosé, and I'll take that drink and raise you a sunny summer afternoon. With warm weather starting to sink in, I'm dreaming of fuzzy, buzzy Sundays, bobbing with icy bevvies in glasses sweating with condensation. But what bevvies, specifically? Every season has its signature beverage, and, seeking boozy inspiration, I hit up a few of Vermont's wine and cocktail pros with two simple questions: What are you drinking right now, and what's your forecast for drinking this summer? Catch their answers after the jump. When I think summer, I go right to rosé; I just love it. [At Simon Pearce] I sort of go crazy with trying to order a bunch of really interesting rosés, and we just run them through by bottle and by the glass. Donkey & Goat’s Isabel’s Cuvee from Mendocino is a really interesting wine; I just blind tasted it with my staff and everybody loved it. In the white world, I’ve been running a lot of wines from the Loire Valley; Grange Tiphaine Nouveau Nez pet nat is a sparkling, bottle-fermented wine, that’s a great one ...To me, that’s just the perfect sitting-on-the-porch bottle of bubbles. Deirdre Heekin at osteria pane e salute is doing some of that here in Vermont and it’s great. I just brought in some wine from her that’s about to go on the list; she works with cold-climate varietals over in Barnard and she does an orange wine; really fun stuff. 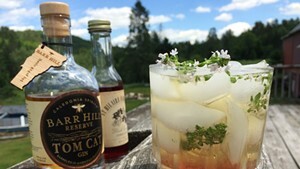 [For cocktails], we’ve got a great relationship with Vermont Spirits — they’re right down the road in Quechee. 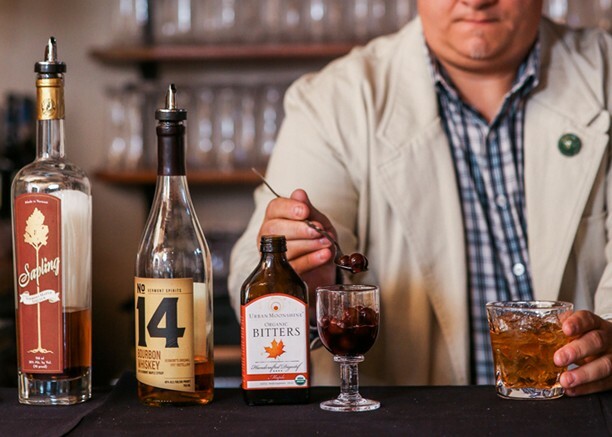 We do a spinoff on the Mason Dixon Manhattan with their #14 Bourbon and maple bitters from Urban Moonshine in Burlington, called “the 1791." We’re also running a drink called “the Kingdom,” with Barr Hill Gin [from Caledonia Spirits], with cardamom simple syrup and Orleans Bitters; you get this herbal floral-honey note from that gin, and the bitter component from the Orleans ... It’s a nice little summer sipper. I just love the Barr Hill Gin, and they’re the nicest people on the planet, just awesome. This summer, we’ll be bringing back the “Battery Park Collins” that’s made with fresh parsley syrup and Hendricks gin with a bit of lemon, and the “San Paolo,” named for our street [St. Paul]. That's a tequila cocktail with strawberry-balsamic reduction, with sugar and limes and Campari. That was really popular last summer and people have been asking when we’re going to put that one back on. Personally, and as a bartender, the cocktail I drink most right now is the Negroni [made from equal parts gin, Campari and sweet vermouth]. Those bright botanicals in the gin, bitterness in the Campari and sweet in the vermouth … There’s something really refreshing about that combination. What’s also great about a Negroni is that it’s just a classic cocktail: base spirit, and then something bitter and something sweet. That’s all you need for a good classic cocktail. Hit up Pizzeria Verità this week for Imbibe Magazine’s International Negroni Week, which began yesterday. For each Negroni sold, the restaurant will donate $1 to Mercy Connections. Sip on five variations of the classic cocktail for a buzz that benefits. Being the bar that we are, a lot of bitter cocktails fit my palate. But, going into June, we’ll be doing something a little lighter. For the last three months, we’ve been doing a draft cocktail. We started with a Negroni variation, and right now we’ve got a daiquiri on tap. That will probably turn into a mai tai with housemade orgeat syrup; something mojito-esque. We’ve already had people asking for that. And we’re the only people doing a draught cocktail right now so that is kind of catching eyes. Wine-wise, we’re definitely coming back to rosé season right now, and the orange wines are really coming up, ones that have been fermented naturally with natural [vineyard] yeast, funky and sour-esque, which is a really cool thing to have for a beer bar. Lately I’ve really been enjoying our new Rye Whiskey … It combines classic spicy rye characteristics with a slightly sweet finish, which creates a great balance on the palate. I just drink it on the rocks, but John [Egan, founder and CEO] has been making a perfect Manhattan with that rye as well, and he seems to really like it very much. He’s really perfected the recipe for that. 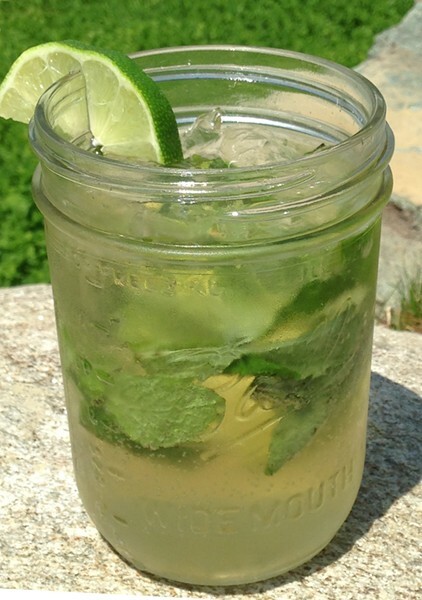 And, for a great summertime cocktail, a slight twist on an old classic may just fit the bill, and the Mad River Maple Mojito is just that!! I personally drink vodka, and I just drink it on the rocks. But in the summer I always try the beers we sell so I can answer questions about them. Right now we’ve got this Mostly Cloudy beer from Long Trail, which is a white beer that’s great for summer drinking. We just updated our drink menu, and we’re making a “Grand Margarita” with Hornitos Plata tequila and Grand Marnier Raspberry Peach. That’s a good summer cocktail. We also made a new drink called the Church Street Breeze, also with that Grand Marnier Raspberry Peach, mint liqueur and soda water. That’s a really nice summer cocktail — you can drink it when it’s really hot. Sometimes it’s so hot you just can’t drink those syrupy, sugary drinks, but this one’s really drinkable; the soda water helps with that.